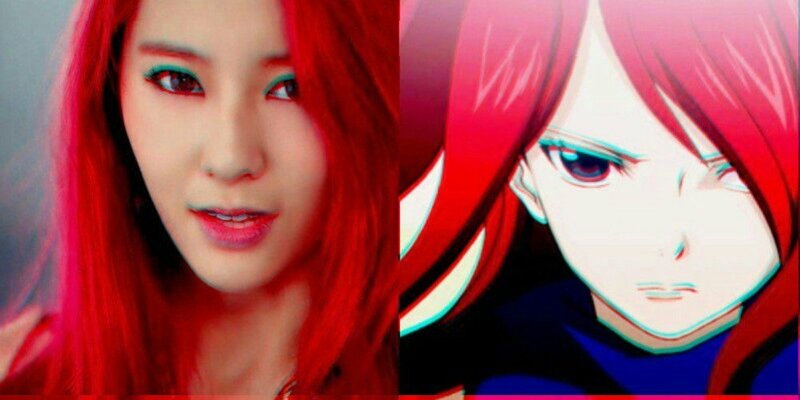 Not only do they have the same fiery red hair but they also have the same fiery personality. Both have a strong chic personality that will fight fiercely for what they believe in but show the love and protection others need of them. Both fierce tomboy-ish personalities are strong in what they believe in and don't let anyone else get in the way of their goals. The two also share an awkward funny personality yet charming and charismatic attraction. Both are strong independent women that fight for what they love and love with all their heart. They are both confident and loyal people to those they trust and hold impeccable skills in their field of practice. Hani, like Bulma has a strong and attractive personality. It's hard to miss either of them when it comes to it and they both prove to be vital in their respective areas. As a master of technology, Bulma created a ton of amazing improvements to technology and Hani on the other hand has created a powerful presence within the KPOP world. Both are girls you do not want to mess with. Cute, cuddly, adorable, and powerful, IU and Mei are both princesses of their own nations. Both have strong aspiration and dreams and do what they can to pursue that goal no matter the consequences. And they're both so incredibly cute. Hyorin tends to show off a tough demeanor but when it really comes to it, she can show her soft caring side similarly to Tsunade. Both people faced a difficult choice, Hyorin with her health and Tsunade with becoming Hokage but ultimately they both pushed through and proved to be a powerful person. Both may seem weak and innocent but they are incredibly strong girls that will stand up against anything that gets in their way. As Kagome is skilled with archery, Suzy too shows talent in that. The two also have a powerful hold over their own thing. Kagome's thing being Inuyasha while Suzy's is the love of South Korea.